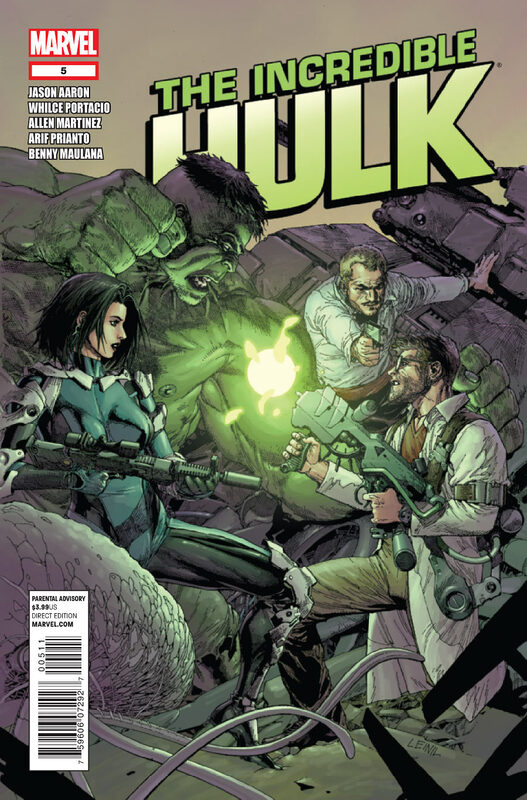 CAUTION: This entry contains SPOILERS for Incredible Hulk #5. You have have been warned. Over the last few months, since the first issue of the new Incredible Hulk series shipped, I've been less than enthusiastic. Some of it's had to do with the woeful lack of artistic consistency in the series. Even today, the interiors are supplied by no less than seven artists apparently just so that this series can ship on-time like DC Comics' "New 52" relaunch. Image Comics founders Marc Silvestri and Whilce Portacio have brought their talents to the series. At least Silvestri helped make the book's relaunch more high-profile than it had any right to be, but he only remained three issues (or less). Portacio took over with the fourth issue, and even contributed to a few pages of the second, but he too has been caught in an artistic rut without room to maneuver. The covers, meanwhile, have been the most visually stunning part of each issue, with the interiors inevitably failing to live up to their promise. This fact is especially, painfully true with the introduction of Leinil Yu, whose art would look, dare I say, incredible on the interiors. Okay, okay--it's not all sunshine and rainbows for Yu, who seems to be actively ignoring the look of the Hulk inside the book, choosing instead to portray him with a high bowl cut instead of the long hair and beard he wears within each story. 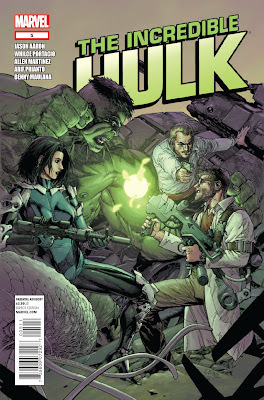 I would say that "getting hit in the face with radioactive monkey crap" is this year's "jumping the shark," but the fact remains that Marvel's Incredible Hulk went downhill somewhere in the planning stages when they decided one of the Future Foundation's series regulars would be behind the titular character's separation from Bruce Banner during the summer crossover Fear Itself. The revelation of his identity and the method through which he separated the duo is supposed to cast further events in a new light, and to a point that happens. However, it also points out a number of flaws in the original story as it was devised, and hints very strongly at the resolution. Does Marvel want to kill Bruce Banner? The Magic 8-Ball says, "Signs point to yes." Yes, I've been wrong before. Still, with all the signs we've gotten recently, the first of which was Banner's huge brain tumor in issue #2, the possibility is out there. In issue #3, we saw the Hulk and Banner shortly after their separation, in front of their mysterious benefactor, with the latter wondering what the Hulk would do now that he had his freedom. And back in Fear Itself #7 we saw what immediately followed the separation, with Banner waking up attached to an I.V. in the middle of nowhere and the Hulk leaping away as the scientist realized, with horror, what had been done to him. With Doctor Doom revealed as the architect of this latest separation--something that, truthfully, we should have seen coming the moment someone with the last name of "Von Doom" showed up in the series--we not only have someone who is among Marvel's smartest known characters, we also have someone with an ax to grind against Bruce Banner, if not his atavistic alter-ego. After all, it was during "Fall of the Hulks" that a depowered Bruce Banner allowed the Leader and MODOK to use a "dumb ray" to blunt Doom's intelligence. And then, when the remainder of the smartest men regained their intellect in "World War Hulks," Banner tricked Doom into thinking he'd also regained his intelligence (but he hadn't). It took intervention by the Future Foundation, the expanded version of the Fantastic Four, for Doom to regain what he'd lost by copying it from the brain of Kristoff Vernard, a young man imprinted with Doom's unique engrams. Of course Doom remembers what Banner did to him. I don't mind that part. It provides a reason for Doom to have incorrectly "wired" the new Banner clone he grew. Certainly that's writer Jason Aaron's intent. It's another imperfect separation, contrary to the Hulk's own wishes. After all, Doom claimed that if he were to totally separate everything Banner from the Hulk, the monster would "be a bit more eloquent than 'Hulk smash,' but still, in essence [...] be the strongest 7th grader in the world." Since he seems to have more intelligence than that, Doom didn't do what was asked of him. The Hulk knows this too, for it was his own memories we saw in the flashback that detailed the separation this issue. What doesn't bother me so much is that the Hulk willed Banner down into darkness to do the deed. It's not like he hasn't done similar things before. He did repress Banner's memories of injuring Betty because he held her while he changed (Incredible Hulk #334). And since Greg Pak returned the Hulk from Sakaar, nobody's precisely been sure what causes the metamorphoses anymore, so we could guess that each can do what they need to. And what really chaps my hide is the apparent idea that the Hulk's incredible healing factor couldn't just regenerate the missing pieces of brain tissue, in which case sooner or later ol' Hulky will end up right where he began. In fact, it's amazing that Doom was able to complete the surgical procedure at all, knowing what we do about the Hulk's very unique physiology. Did Banner really "[work] for years on a way to separate" himself from the Hulk before admitting defeat? Only if you consider "separate" to be a euphemism for "cure himself." Banner has long held that the Hulk is all of his most destructive urges given form, so why would he merely wish to cleave that part of himself away? That part's wrong, too. I don't much agree with Aaron's ideas, ranging from yet another imperfect separation of man from monster using a clone whose existence I prophesied, to the Outcasts version 2.0, to using another set of heroes' arch-villain to facilitate the process. I can see the whole "Hulk accomplishes things with his fists; Banner does things with his mind" shtick on horrid display with this issue's confrontation between Banner and the M.A.D. Squad, as hackneyed a "secret organization" as ever existed. (Dig all of the blatant exposition masquerading as Banner's dialogue, kids!) I can also see that, well, we're being set up for the big conclusion of "Hulk Vs. Banner" and its inevitable aftermath. Of course, we'll be made to believe it's a permanent thing. 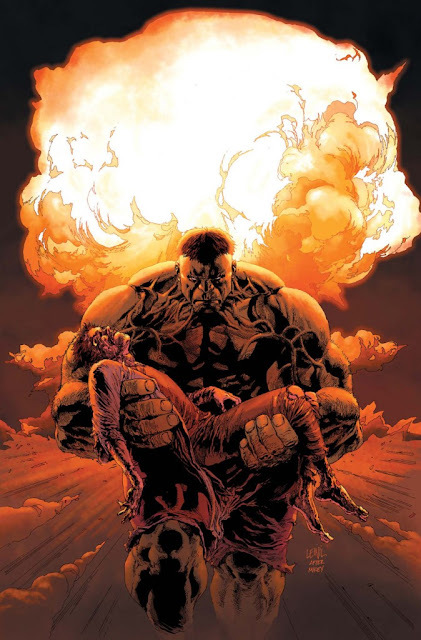 The Hulk will lament the loss of his other half, however briefly, and the fans who never liked Bruce Banner in the first place will rejoice that the character's finally got his much-deserved freedom, never again having to transform into that weak, pink-skinned shell of a human being they only had to tolerate until he became angry. Then, the Hulk's brain will heal. And Banner will return. And he won't actually be the same Banner as who raged against the Hulk in these first several issues, so we won't hate him anymore. It was "the clone" who did it, after all. Not the "real" Banner. Rah, rah. And what will we have when it's through? Another "what if" adventure that Banner remembers nothing about. 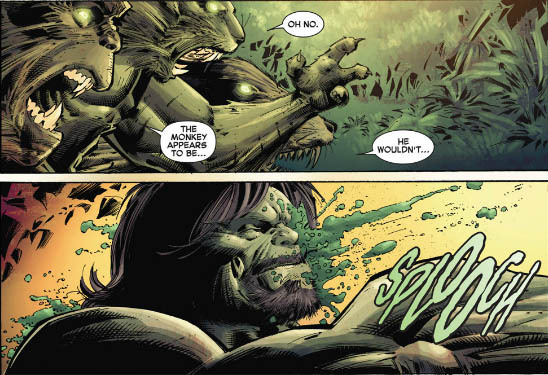 And yeah, a "what if" story in which the Hulk got hit in the face with radioactive monkey crap. I will admit that Aaron's execution has not always matched his ideas here (unlike in Wolverine and the X-Men, which might be Marvel's best book at the moment) but I also think you're giving the book some short shrift. I agree that Hulk will eventually "heal" so that Banner returns, but whereas you seem to see this as kind of a cop-out, I see it as entirely the point: Banner and Hulk have never been successfully separated because they can't be separated. 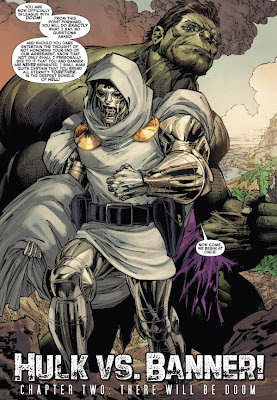 If Doom wants to get his revenge against Banner, then this is actually a fair way to do it: create a Banner clone that is insane; the Hulk is not Banner's burden, it is the only thing that keeps him healthy, something that the separation process "proves" in both mind and body (insane clone, mental regeneration within the Hulk). Again, I think that the execution of these ideas hasn't necessarily been as good as one could hope (unlike W&tXM, this title uses a decompressed narrative strategy; it's taken five issues to get through less material than what it took Aaron to introduce in three issues of the mutant title). But he's attempting something far cannier here than I think you let on; rather than see it as a disappointing plotline, think about how it might advance what has been the character's central theme for about thirty years now. The inconsistencies in the art, by the way, have at least partially been due to Silvestri's medical problems (http://www.comicbookresources.com/?page=article&id=35401). I haven't read Fear Itself, so I'm surprised to learn that Doom was revealed as the cause of the separation in that series instead of this one. As for the story itself, I agree that this Banner is an evil clone created by Doom, or something similar to that, and that perhaps the "real" Banner is still within the Hulk. I actually have no problem with that. What does bother me a bit is the fact that Hulk would make a Faustian deal with Doom, especially after seeing Ross made a similarly devilish deal with the Intelligencia. I would think Hulk would no better than to do such a thing, his hatred for Banner notwithstanding. As for the Mad Squad, there's a secret ops force for everything else, why not mad scientists? I don't despise the series as you do, but I do admit it's hard to see what everything is leading up to. As much as I agree with your commentary on the storyline, I always tend to give a pass to these writers, simply because the older these characters get, the harder it is for anyone to do something new and fresh with them that hasn't been done before. I didn't really like Planet Hulk, just wasn't my cup of tea, but it was something different (if not shades of Jarella, though) and I give credit for that. The Hulk/Banner separation angle has always been a weird route for them to take for me, though. Remember, Doc Sampson did it with little success in the 80s and the reason was because one couldn't exist without the other. The Hulk is supposed to be a twisted rage-filled version of Banner--but he ultimately still is Banner. If they're going to claim they're really two separate beings, then to me you're entering Don Blake/Thor or Rick Jones/Captain Marvel territory--both exist separately of one another, they just time share existence in this dimension. That's not the intent behind the Hulk as created and you're right--what the hell even causes the transformation anymore? Banner and the Hulk change spots when it's convenient for the writer, not because of any actual logical explanation in the comic world. Plus I can never tell which Hulk "incarnation" it is anymore. It used to be a big deal when the Hulk showed any signs of higher intelligence (i.e., Banner) outside of the grey Hulk and up until Peter David's run of the merged Hulk. Now it seems like while he's not going to be participating in any MENSA contests anytime soon, he's at least as smart as your average street thug--and that detracts from the character for me. Again, I tend to give a pass because after a character's pushing 50 years old and thousands of stories have been told about them, it's increasingly difficult to tell "new" stories without pushing the envelope into the absurd sometimes. But that being said, when you start straying too far from the core concepts behind the character, you might as well just give up. And notice how I didn't even touch the f'ing RED Hulk. Ugh. Thanks for writing this up. Personally, I can't read Marvel since that bozo Axel Alonso was made EIC, but my favorite character seems to be in a very sad state. And even though Rulk and the marvel wide Hulk-out thing made me stop buying the book for the last time, I can't help but feel bad for readers hanging in there. But I swear the comics division of marvel hates the character, given his and the fans treatment. this is the most ridiculous book I have ever read. the artwork is horrible. They should try to get todd mcfarlane to come back. Smh. Paul P would have been an excellent choice for this new series.They should have just made it a limited series called hulk verse Banner. Hmm..how come banner does not look the same aka like banner & how come nobody have talked about how much the hulk looks like skaar. Thanks for the write up. You had me laughing out loud. But what is hard for me was with Greg Pak's very last story we were left with the core message that the hulk and banner are one. Or at least very close to one. And now they are separated, which seemed to happen way too soon after Pak's last story. And in the stories where banner cannot become the hulk, he is extremely different then this 'thing'. I was wondering if this could set up the clone to be a Maestro of sorts, especially if that bomb goes off. And once the hulk heals, we will see the real banner again. thanks for your blogs, they are very enjoyable. there is no way that a clone is going to become the maestro. We all know what happens... unless of course you are not a fan of the hulk. the clone is going to become a more popular in cooler version of the hulk and he me will be called The Scarlet Hulk. and even better idea would be for the clone banner to get with hiro the dark sun and get revenge on the hulk family. And stop trying to sell your website on somebody else's blog lady that's not cool! !